Entry Fee: RM250.00 (Ringgit Malaysia Two Hundred Fifty Only) per person inclusive of Green Fees, Buggy, Goodies & Dinner. Withdrawal: Withdrawal from the Tournament will not be entertained after the closing date and entry fees will not be refunded if a withdrawal is made after the said mentioned date. Rules of Play: Play is governed by the Rules of Golf of the Royal and Ancient Golf Club of St. Andrew and and the Local Rules approved by the Organizing Committee. o The Tournament shall be managed by the Organizing Committee of the 1st KakiGolf Challenge 2012 whose decision shall be final on all matters pertaining to the tournament. o The Organizing Committee reserves the right to reject any entry without giving any reason. o In the event of circumstances which make playing any holes unplayable and/or completion of all 18 holes not practical, the Organizing Committee reserves the right to cancel any rounds at its discretion. o The Organizing Committee, will not be responsible for any loss, damage or harm or any form of injuries that the participants of the tournament may suffer as a result of their participation in this tournament. HOW TO REGISTER FOR THE TOURNAMENT? Registration for this tournament is strictly through KakiGolf.com’s forum. This means that if you are reading this but have not registered yourself with KakiGolf.com and you intent to participate in the tournament, then you would need to register with KakiGolf.com first. 5. Your contact number, preferably your mobile phone number. Prizes for tournament winners and Lucky Draw prizes for participants. Please refer to the instructions detailed in "ON-LINE PAYMENT INSTRUCTIONS FOR ENTRY FEES!" below. You are required to READ the following instructions carefully. 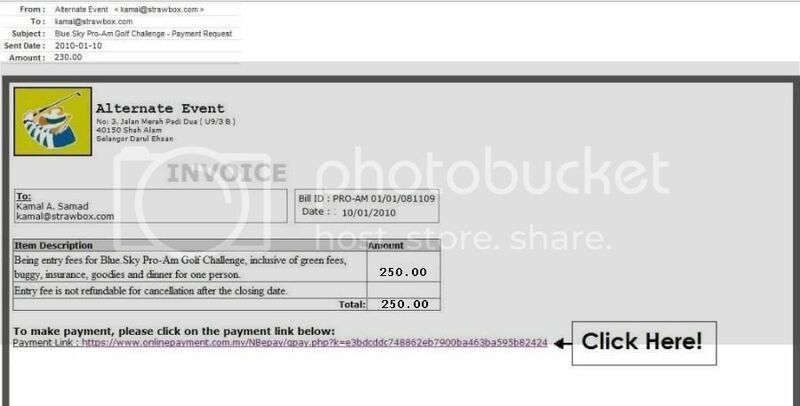 Please be informed that you may also opt to pay via ON-LINE to make payment for the KakiGolf Challenge's Entry Fees. AND we actually prefer this payment method than the conventional banking-in as it is administratively easier for us to track payments made. All participants will be sent an e-mail requesting for payment, so please ensure that you had given us a VALID e-MAIL address. You will be receiving an e-mail from Alternate Event and the subject title for the e-mail will be Entry Fees for Blue.Sky Golf Challenge as illustrated in the picture below. Do check your spam box if you have not received any payment request from us because our e-mail might be mistakenly diverted into your spam box. If you opt for credit/debit card payment, please fill in the required information and then simply click on the PAY ONLINE button. 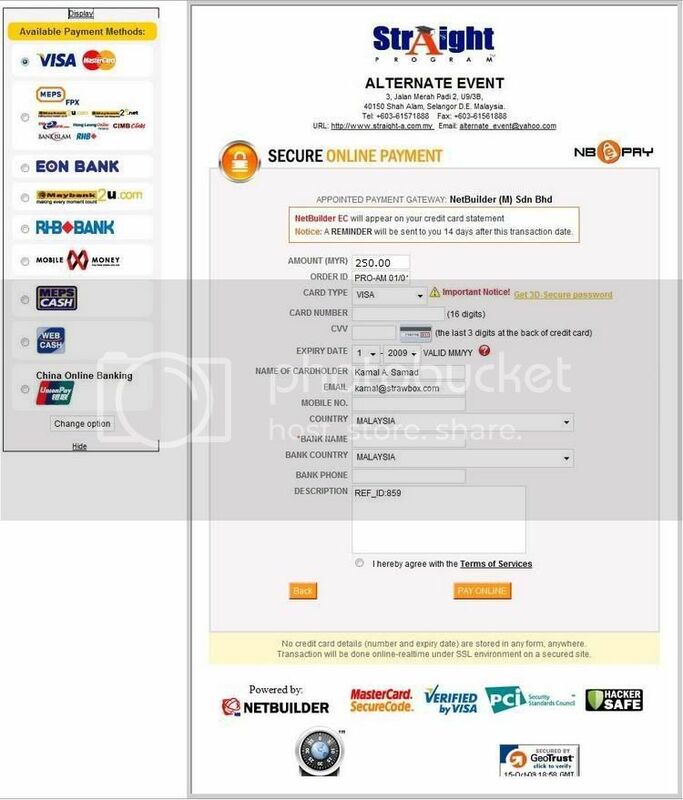 Should you prefer to pay through bank transfer, just click on the DISPLAY button found on the top left-hand corner of the web-page. Once this button is clicked, it will display a list of banks from which you will be able to make the transfer for payment. For your information, our experience tells us that credit card (Mastercard) payments are usually a much more hassle-free option than paying through online bank transfers. REGISTRATION FOR 1ST. KAKIGOLF CHALLENGE 2012!